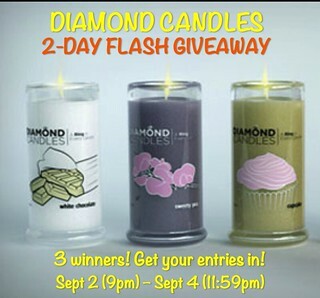 Bay Area Mommy and some awesome bloggers have teamed up to bring you this 2-day Diamond Candles flash giveaway! If you haven’t heard of Diamond Candles yet, these are scented candles that have a ring inside worth $10-$5000! So if you’re lucky, you might just score a high-value ring! Three (3) winners will be chosen which means you get more chances of winning! Giveaway runs from September 2, 9pm EST to September 4, 11:59pm EST and is open to US residents only since Diamond Candles does not ship outside the US. 18+ only. Winner will be emailed and will have 24 hours to reply. Please add “isis@bayareamommy.net” to your Address Book to prevent the email from going to the Spam folder. for me. heck I’m the only one who’s awake to burn the candle. For me! I’ve never had one! It would be for me. I am seeing a lot of things and want to try one. Would be so cool. I have heard these candles are the greatest at scents..? I would love to win this for my daughter! She loves candles and has them everywhere in her house! I’d love to give this to my mom because she’s done SO much for me and my kids. Her birthday is coming up and I’d love to surprise her with a Diamond Candle. It would be for me. I love candles, but I don’t have any and I’ve certainly never been able to try Diamond Candles! THANK U FOR THIS GIVEAWAY!!!! I AM EXCITED!!!!! I would definitely put this baby up in my house!!!! I am buying more for Christmas presents!!!! I would give one to my mom, one to my daughter, and keep one for myself. I would keep it for mysel. I have been dying to try these. My mom, sister, and I.
me i never won one and cant afford it. One for my sister and one for my mom! not gonna lie…its for me!!!!!!!!!!!!!!! The candle wouuld be for…Me! I would keep it for our living room. I usually burn yankee candles but I’m always looking for alternatives. if the smell isn’t too strong I’ll give it to my sister. It would a gift for my mom. It would be for some very special ladies! Me, I’ve never had one. I would keep one and the other two would be for my sister in law and my mother in law. This candle would be for me because I absolutely love candles and I have been wanting one of these. Thank you for the opportunity and I hope I win. I hate to sound selfish, but this would be for me! Since I am not able to work anymore, money is very tight, so I would give these to my daughter for Christmas. Thank you for the opportunity to win this giveaway, and good luck to everyone. If I win of course the candle’s going to be mine!!! I would keep it for myself!! I love candles!! I would keep this 1 for myself as a treat since I have had a bad weekend!! Been wanting to try one of these forever!!! I would love to win, I’m told these candles not only have the prize inside but smell wonderful. I would love to win one for these. It would be for me ! I would probably keep it for the same reasons as Paula (post #74) gave!! !